宝贝 was holding the leash of her toy camel and dragging it around the living room. She does that quite often all the time, pretending that she’s walking her dog.. =.=” But this time, seated on her camel was a …. giraffe?! Me : What are you doing? Why is the giraffe sitting on the camel?? 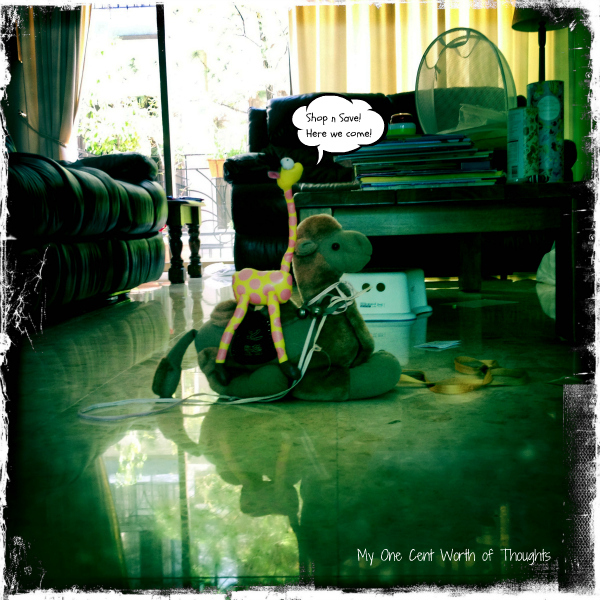 宝贝: We are taking a walk and the giraffe is tired…. so it’s riding the camel. Me : (ah ok…) Where are you going to? 宝贝: We are going to Shop n Save (there’s a shop n save about 5 mins walk away. My dad brings her there quite often for grocery shopping.) to buy pears. I felt so tickled by the sight of the giraffe on the camel and her most unusual story…. My girl is growing up, she brings her pets shopping for pears! !